The only time that female sea turtles comes on land is to lay eggs. Male sea turtles never return to land unless they are stranded on a beach. Females will travel hundreds or even thousands of miles to return to the same location or beach where they hatched. Most seat turtles lay their eggs at night. Females approach the beach beyond the high tide line, dig their nests and deposit their eggs. A clutch is a group of sea turtle eggs which can include up to as many as 150 eggs. During nesting season females my nest several times. After the female sea turtle lays her eggs and covers the nest, she begins her journey back to the sea. The eggs begin to hatch 45 to 70 days later. It is very difficult for hatchlings to make it to adulthood. 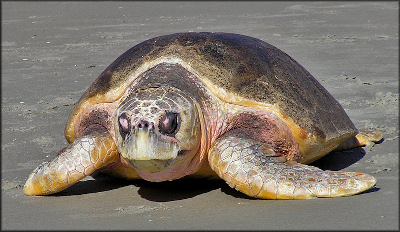 Sea turtle eggs can be lost due to storm tides, raccoons, lizards, crabs, maggots, ants, beetles, rodents and humans. Sea turtle hatchlings are vulnerable to birds as they attempt to make it from there nest to the sea. Once in the sea, young sea turtles can become pray to sharks.